Data permeates our world. From our personal data to the unfathomable depths of syndicated data sources, it’s a hot topic rife with equal parts opportunity and controversy. Legislation like the GDPR has spotlighted data and the subsequent challenges with maintaining privacy. While these changes have forced businesses to be conscientious about how customer and prospect data is collected and used, they haven’t lessened data’s significance. Data is still integral to the way businesses function and set strategy. A challenge arises when business people want to leverage data to better do their jobs but lack the data literacy to really make that happen. After all, business people can’t become statisticians overnight, and even the most well-rounded salesperson can struggle to make sense of the complex relationships between numbers. Until recently, data scientists and analysts have acted as interpreters, analyzing data on behalf of business people and answering the day-to-day questions that support business strategy. Now, things have changed. The arrival of artificial intelligence and machine learning in the business intelligence space has led to the era of the citizen data scientist. Gartner’s definition puts the term into important context. Citizen data science is a professional responsibility held by typically non-technical people, such as marketing managers. At the same time, “citizen data scientist” is not a profession in its own right, but an important aspect of roles that require data-driven decision-making. Simply put, business people need to understand data to make educated decisions about strategy. Advanced analytics platforms — those that incorporate artificial intelligence to automate data analysis — are shouldering the technical burden. These platforms parse through data and spit out insights that are easy for non-technical people to understand. Thus, citizen data scientists can fill a unique, but important, role. Citizen data scientists can complement the efforts of data scientists and analysts and fill in the gaps that occur when business people must depend on technical experts to get answers about their data. Enabled by various analytics and BI tools, citizen data science is developing in tandem with machine learning— which means there’s a world of opportunity on the horizon. 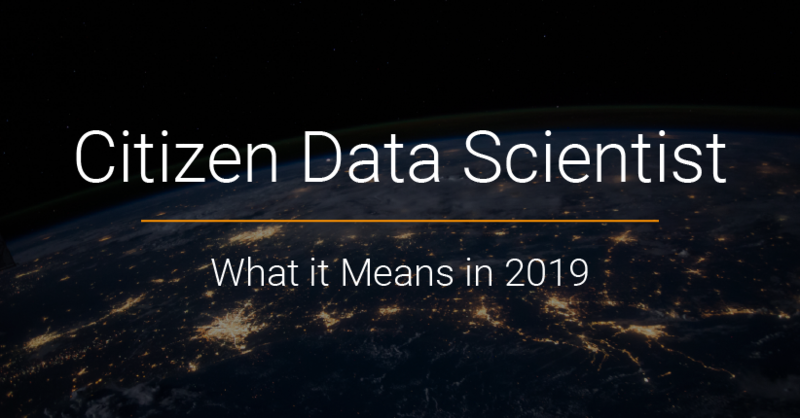 So what does it mean to be a citizen data scientist in 2019? As we mentioned before, citizen data scientists are empowered to do their own data research and make decisions based on what they find. The independence that citizen data science grants eases the burden on data scientists and analysts, who should be focusing their energy on deeper projects, like writing algorithms of their own and building advanced data models. Simultaneously, business roles can get quick returns on their data-based questions. Of course, this change is the most obvious increase in efficiency, but citizen data science carries even more opportunities under the surface. As we mentioned before, citizen data science is enabled by analytics and BI tools that are designed for business users instead of a technical audience. Advancements, like natural language processing, are some of the most important factors in a non-technical interface. After all, the non-technical analysts can’t write SQL or pull special calculations out of thin air. Their process hinges on asking questions in plain language. Natural language processing allows business users to type the words and phrases that are intuitive to them into a tool. The tool translates these phrases into computations on the back-end and generates answers in the form of natural language insights (a related feature called natural language generation). The ability to ask questions in natural language is key to empowering non-technical analysts in the first place. When business people can ask the same questions that pop up in meetings every day, then they can get the most relevant, pressing information from their tools. Now — how does this impact workflow? Natural language processing lowers the barrier to entry from “business person” to “citizen data scientist.” Non-technical users can simply ask what they mean, instead of translating their question into a string of keywords or variables. As such, they can focus their brain power on the answer, instead of the process. The simpler, easier, and more intuitive the process, the more likely they’ll engage and repeat it as needed. Natural language means asking questions, follow-up questions, and more follow-up questions— enabling more creativity, more curiosity (traits that every scientist needs). Natural language facilitates an organic problem-solving approach. Citizen data science will not only streamline workflows by eliminating the back-and-forth between data scientists and business people, but it will also remove common workflow hindrances that slow people down and exacerbate their patience. Efficiency is key for citizen data science (and, of course, success for any business). That said, this new iteration of the business person will require some additional thought from businesses who see its advantages. With data compliance under a microscope, it’s important that companies consider the implementation of citizen data science. First and foremost, it’s important that companies outline data governance and classification. Data that’s aggregated from clients or customers will be more touchy than internal company data. Businesses should determine how different types of data will be shared or accessed among the team. You can, for example, classify different data sources according to their accessibility. “Classified data” may be relegated to team members with explicit permission to access, as it may be sensitive in nature and potentially damaging if released. “Unclassified data” may pose little risk and be available for everyone, including the citizen data scientist. Risks can be further minimized with data security training for your team. After all, it’s important that citizen data scientists understand the value of data from all angles. Lastly, businesses should consider how to encourage citizen data science among their team. It’s unrealistic to flip a switch and expect business people to gain literacy in data overnight. Familiarizing yourself with the latest AI-based analytics platforms is a good place to start. The easier your chosen BI tools are to use, the more likely your team is to incorporate them into their processes. In order to succeed, the citizen data scientist must be supported with the right platform. See how AnswerRocket can help you empower citizen data scientists on your team.